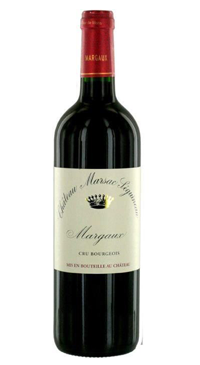 Chateau Marsac Seguineau is a Cru Bourgeois Bordeaux from the northern edge of the commune of Margaux near the border with Saint Julien. The castle Seguineau Marsac, owned by Credit Agricole, is managed by the same team as the Tour de Mons. Christel Spinner, to technology and Eric Boissenot, consulting oenologist. Vineyards are situated on the Garonne, gravel mixed with sand and clay. The ten hectares are planted to about two-thirds Merlot. The grapes are harvested manually and hand sorted before fermentation in stainless steel. The wine is then aged for 12 months in oak barrels (24% new). This Merlot dominant red exhibits red fruit and moderate oak influence on the nice coming through as a pleasing sweet spice note. Plush and plump texture with blackberry and spice flavours.